Fred. Olsen Cruise Lines pride themselves on offering a special cruising experience to their guests. With a fleet of four ships, Balmoral, Braemar, Boudicca and Black Watch, Fred. Olsen Cruise Lines cover a wide range of destinations worldwide. One of the most popular from the U.K., and well worth considering, is a cruise to the Norwegian Fjords. My wife and I were booked on flagship Balmoral, our first sailing with Fred. Olsen and we were looking forward to the experience. After embarkation at Southampton we made our way to our cabin, a Superior Outside. The cabin was spacious, well appointed and very comfortable. Lots of hanging wardrobe space and a separate bathroom with shower. There was a large picture window to watch the world go by, not that we planned to stay in the cabin for long, there was a whole ship to explore and discover! Cabin grades to suit most budgets vary from suites, balcony, outside, inside and single. After dropping off our carry- on luggage we made our way to the Palms Café at the rear of Deck 7 for a welcome aboard snack and afternoon tea. Balmoral is Fred. 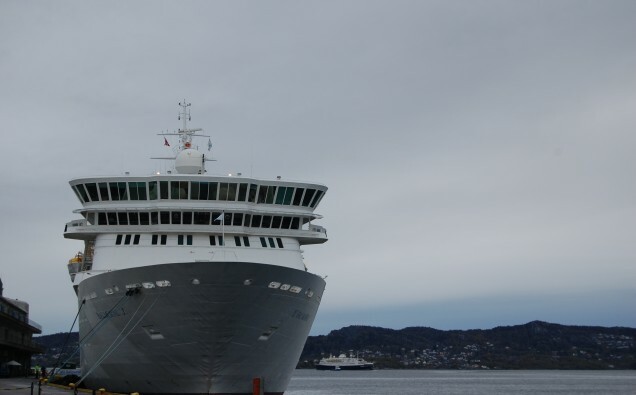 Olsen’s largest and newest cruise ship named after the Scottish home of the Royal Family. A traditional cruise ship, very appealing and a lot smaller than most cruise ships being built now which gives a distinct advantage of being able to access smaller ports without tendering and allows the crew and staff to get to know you, refer to you by name, find out your likes and dislikes and generally make you feel a welcome and valued guest. There are 710 cabins and plenty of spacious lounges and public areas for the 1300 guests the ship can accommodate. off on our 8 night cruise to the phenomenal Fjords. Now, however, time to change for pre-dinner drinks before making our way to the restaurant. The Marquee Deck 11 is a lovely relaxing area with sun deck, comfortable lounges, golf nets, the Observation Lounge and bar, swimming pool and two whirlpool jacuzzi’s. Atlantis Spa is situated on Highland Deck 10 with an abundance of treatments available for your self-indulgence – well why not .. you are on holiday! A fully equipped Fitness Centre takes up the front of the ship on Deck 10 and there’s a further pool on Lounge Deck behind The Palms Café. The shops onboard offered a great range of goods and gifts from fragrances, cosmetics, and bags … to clothing, fashion accessories and jewellery. Most evenings my wife would purchase some accessory to wear much to the interest and delight of our fellow dining companions! We cruised and gazed in awe at the magnificent Fjords including the UNESCO listed Naerøyfjord and one of Norway’s longest – Nordfjord. One of the itinerary highlights for me was the stop at picturesque Flam with its magnificent landscape. Here we took another tour, expertly organised again by Fred. Olsen Cruises, on the famous Flåmsbana Railway regarded as one of the steepest and most beautiful journeys in the world. On the train our friendly companions in the adjacent seats had done this tour three times and at the end we could certainly see why. Spectacular mountain scenery, wonderful unimaginable waterfalls, breath-taking Fjords, this was a super Norwegian experience. Thank you Fred. Olsen Cruise Lines, we loved your ship, your food, your people, your itinerary and your tours – here’s to next time!